Airsoft is generally gear-intensive, and there’s a good chance that you’ve got a bunch of equipment you’ll want to take onto the field with you. Your pockets might work fine if all you’re carrying is a spare magazine or two, but if you’re hauling anything beyond that, you’ll want a chest rig of some kind. It’s easy to become overwhelmed, though, at the staggering amount of options you have; not only are there a bunch of brands to choose from, but chest rigs also come in all different shapes, sizes, configurations, and prices. While many airsofters are happy to spend a lot of money on a high-end MOLLE plate carrier and a variety of pouches and pockets for every possible scenario, that just isn’t necessary for all players. If all you routinely need to carry with you in your skirmishes are a handful of magazines, some extra BB’s, and an accessory or two, there’s no need to go overboard. 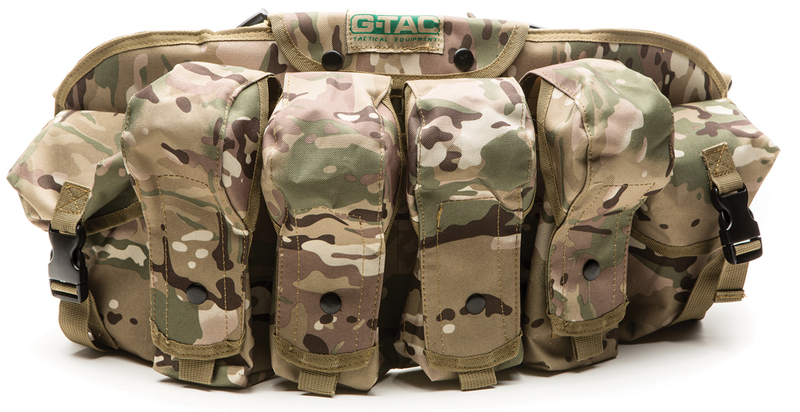 Enter the G-Tac AK Chest Rig Fast Vest; the name might be a mouthful, but with those superfluous words come some very useful features that the budget-minded airsoft enthusiast will appreciate. MOLLE COMPATIBLE: Sort of – Although the rig itself is not MOLLE-compatible, each shoulder strap sports a pair of one-inch D-rings, which could conceivably be used to hold a small MOLLE attachment, such as a pistol-magazine pouch. OVERALL CONSTRUCTION: While not as heavy-duty feeling as some of its more expensive counterparts, this G-Tac rig is plenty sturdy, especially considering its low price point. However, I found the stitching to be a bit sloppy. It works, but it’s not pretty. CAPABILITIES: (2) Utility pouches, (4) magazine pouches (each of which will hold a pair of AK magazines or a trio of M4 mags) a pair of one-inch D-rings on each shoulder strap, and (1) internal map pocket. Two AK or 3 M4 mags – whether your weapon of choice is foreign or domestic, you’ll be well equipped. 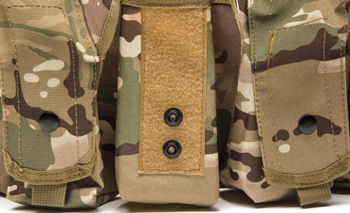 The AK Chest Rig Fast Vest (AKCRFV from here on out) features seven pouches – four mag pouches, two utility pouches and a map pocket built into the carrier itself. The four magazine pouches are fairly spacious – testing them with the magazines I had on hand, I found that they’ll each hold two AK magazines, three M4 magazines or five MP5 magazines. When used with M4 magazines (arguably one of the most widely used varieties in the industry), I found the fit to be a bit on the tight side with three magazines in one pouch – they all fit and the flap will close, but I personally would be inclined to only carry two in each pouch unless I absolutely had to carry more than eight magazines at a time. Speaking of the flaps, each of the magazine pouches is held shut by both Velcro and a snap fastener. Inside each of the magazine pouches is an elastic divider, although this feature doesn’t seem to contribute much to the functionality of the pouches. 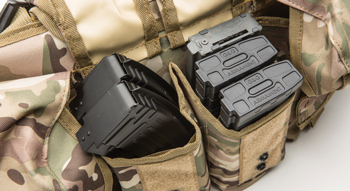 You’ll find a 6 1/2 x 5-inch-wide utility pouch on each side of the row of magazine pouches that is capable of holding gear about 3 inches thick. Unlike the magazine pouches, they use a strap and side-release buckle to stay shut – no Velcro here. These pouches are great for accessories: speed loaders, grenades, batteries, a dead rag, tactical snacks, etc. It’s a tight fit, but I found that a full bag of 5000 BBs will just make it in and still allow the lid to close. The AKCRFV also features an internal map pocket, but its functionality is hindered somewhat by the small size of the opening. Although the pocket uses up the full 24 inch width of the vest, the opening is only about 6 inches wide, so you may have to fold, roll up, or otherwise distort your map to get it to fit, depending on how large it is. Access to the map pocket is hidden under the logo-adorned flap, which is secured with two snap fasteners. The shoulder straps (which are intended to criss-cross behind your back) feature foam padding for added comfort, and both straps feature a pair of one-inch D-rings, giving you a little room for customization – you could thread a single MOLLE strap through them to add a small pouch, or hang something off of them with a carabiner. The back strap is a plain 1-inch-wide affair with a side-release buckle. There are four belt loops hanging from the bottom of the rig in case you’d like to add a pistol belt, which will offer more stability, as well as more room for customization. Magazine retention is solid with the built-in redundancy, but I found the snaps weren’t really necessary. Still, it’s a nice touch. Gearing up, the first thing I noticed is that the shoulder straps are a bit on the stiff side – they’re padded with foam, but that foam is thin, and the strap material itself could use some breaking in. The rig is still comfortable to wear and I expect that the straps will become more pliable with time. You could always wear the rig around the house to get it ready for action, provided you don’t mind the weird looks from your family and you remember to take it off before answering the door! With all of the straps buckled and tightened, everything fit nicely without too much extraneous movement while running. One nice thing about the rig is that the pouch layout is symmetrical, so while there’s very little you can customize, it’s at least ambidextrous by default. I found that I easily had enough space to carry all the magazines I needed for my G&G M4 (your mileage may vary, depending on your magazine capacity preference and how heavy-handed you are with the trigger), up to 5000 extra BBs, a spare battery, a speed loader, and a small bottle of anti-fog spray for my glasses. You can even fit a 20-ounce beverage bottle in one of the magazine pouches if you’re willing to give up a little magazine capacity. Access to the magazine pouches was quick and easy, and mags pulled out smoothly, although it was a bit tricky to get M4 magazines back in if you’re trying to fit three in one pouch. Although the mag pouches close with both Velcro and a snap fastener, the Velcro alone is strong enough to keep your magazines secure. The utility pouches use side-release buckles, which means that they’re not as quick to open and close. The upside is that the contents of these pouches are going to potentially be held in more securely than with Velcro, but if you need to take out whatever is in the pouch in the middle of the firefight, it will take a little more time and effort than simply grabbing the bottom of the flap and pulling it up. Overall though, I can’t find much to complain about the AKCRFV in use. There’s something to be said about a product that simply does what you want it to do, and at a reasonable price. 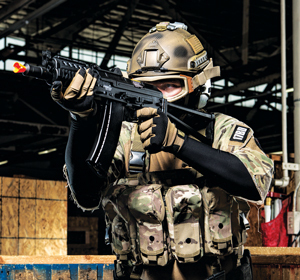 Sure, the fit and finish of the AK Chest Rig Fast Vest aren’t as refined as its more upscale competitors, but there’s a point of diminishing returns when it comes to how much you spend on gear like this. Unless you’re planning on being involved in real combat or have some specific load-out requirements this rig can’t meet, it’s a great value for the money, and a piece of equipment I would happily recommend for new and budget-minded airsofters.